I was motivated by a mommy friend, Ronit from @leagueofmoms, to write this post after she spoke at the MOMSTO Wine Festival last month. And since I’ve been on maternity leave now for seven months it feels like the right time to share my story and how I’ve been living my best and healthiest mat-leave life too. Plus, as cliché as it sounds, time if flying by all too fast! I’ve tried my hardest to make the most of each day, but #MomLife often gets the best of me. With that said, here are my tips to making the most of mat leave, as well as the real deal when it comes to doing so! Tip #1: Shake Whatcha Mama Gave You! That’s right, get moving! Hit the gym, do a yoga class or simply push that stroller around the block. Get your blood flowing because it can work wonders for your mood. God bless those post-workout endorphins because that high beats the rush from that first cup of coffee. Okay, that’s an exaggeration, but you get my point. Just move it, mamas! 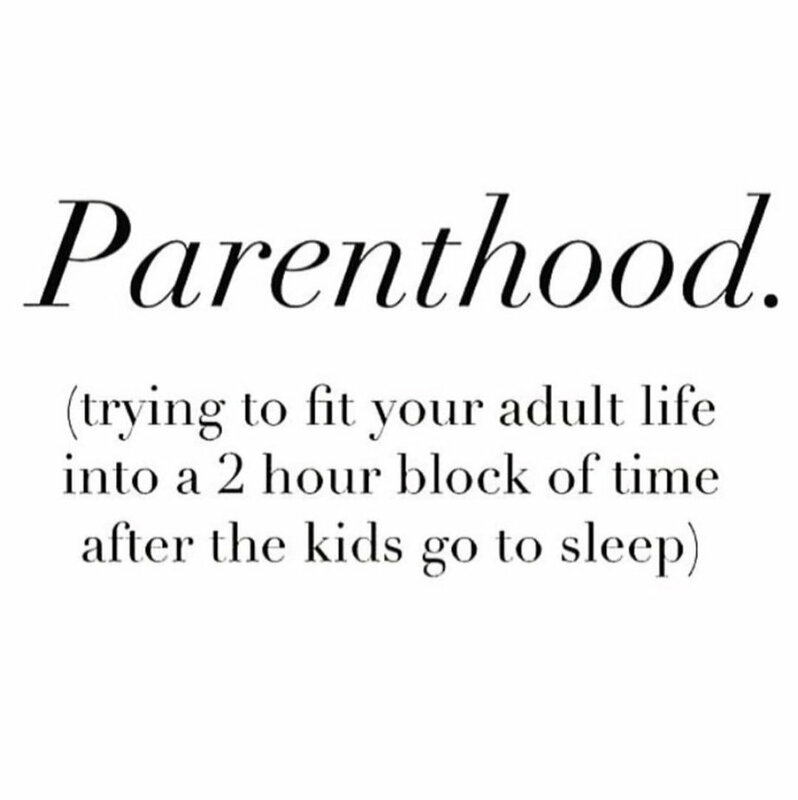 #MomTruth: There are days when baby Noa is up at 4:30 AM and refuses to go back to sleep. I’m so tired those days that I barely want to lift a finger, let alone a dumbbell. These are the days I do the zombie walk pushing her in the stroller in search of the strongest Americano. Don’t beat yourself up if you have these days and miss that HIIT class you signed up for. It’s our reality. Just try and make sure to at least get out for a walk to get some fresh air! Tip #2: Don’t Forget to Eat. 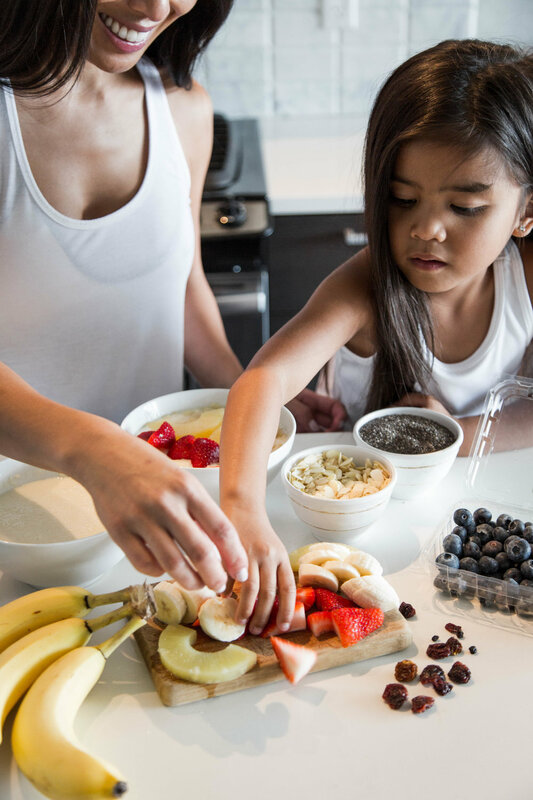 Fuelling your mom bod with healthy and nutritious food is so important to keep your energy levels high and manage everything being thrown your way. This is especially true for the breastfeeding mama! Meal prep is key and this doesn’t have to be those elaborate stacks of Tupperware you see on instagram. This could simply mean making a pot of chilli to last the week or cutting up fruits and veggies to have on hand when you need it most. Consider taking out the good ol’ slow cooker, so that dinner is ready without you slaving in the kitchen for hours. Make overnight oats the night before to have on the go the next morning. Don’t over think it, but definitely do it. #MomTruth: I forget to eat. I’m too busy to eat. I don’t have food to eat. Motherhood doesn’t come with a menu and I admit, there are days I will look at the time and it’s almost 12 PM and I haven’t ate. I’ve had a coffee that I’ve warmed up 3 times, but forgot to eat because I got caught up throwing a load of laundry in the wash, nursing Noa and then scrolling on the gram. This is bad, I know. Real bad. But it happens to me … and I’m sure to many of you. My advice is that once you remember to eat, eat! Everything else can wait a few moments. Just eat. Tip #3: Make Time For Self Care. As hard as it is to wrap your head around this concept, you need to do it. You HAVE to do it. Dedicating time for YOU is so important for your mental health. Rely on friends or family to give you some relief, so that you can get that much-needed manicure or massage. Indulge in a bubble bath after the kiddies go down or make time to meet your girlfriends for lunch (sans baby). Book a trip for you and the fam and make sure to enjoy some solo time while you’re away! Self-love isn’t an option; it’s an obligation in order to “live your best mat leave life ever”. #MomTruth: I put myself on the back burner because let’s be honest, there is never any time. I’ve been guilty of denying myself some ME time. It’s hard to leave for an extended period of time because Noa doesn’t take a bottle anymore. It sometimes feels like a lot of work to get out of the house to do anything. Travelling with the family is hard AF and isn’t very relaxing. Am I right? I’m certain this is normal and I catch myself putting self-love aside. It’s moments like this when we need to remind ourselves that if we don’t care for ourselves, no one else will. There’s no better time to travel than during your mat leave. You don’t have to request vacation time from your manager and your new babe is still free! Noa is 7 months old and she has flown to Mexico, Montreal, Miami and most recently, to Colombia. And if planes aren’t your thing, mini road trips are always fun. Creating adventures in new cities has helped my family bond in ways I never imagined. #MomTruth: Sure, we’ve gone to a few places, but I won’t lie … it was incredibly hard! I worried about everything from how much or how little sunscreen she had on to getting her to sleep at a decent time at night. Yes, travelling with your family is no walk in the park, but like I mentioned earlier … creating those memories is worth every missed nap and late bedtime. Tip #6: Mo’ Mommy, No Problems. Get off the gram and meet some mamas in real life. I just started taking music classes with Noa and have enjoyed making new mommy friends. Need ideas? Try a mommy and baby yoga or barre class to expand your mommy network. Hit up the local drop-in centre or library. Talking with other women who are going through what you’re going through can make all the difference. #MomTruth: It is so not easy to get your a$$ out of the house with a new baby in tow. It takes triple the time and by the time you get out, you feel like you pretty much have to head back home for the baby’s next nap! Ahhh! I get it. It’s a lot work, but once you find your groove with getting out the door, it gets easier. Promise. Plus, maternity leave can get lonely, so don’t be afraid to socialize. Tip #7: Go Ahead and Shop. What is it about maternity leave that makes shopping so much sweeter? Treat yourself every now and then with an outfit you love. You deserve it. Whether it’s online shopping or while you’re doing stroller laps at the mall, don’t feel bad about buying yourself a little something. Taking care of a little baby can be exhausting and retail therapy works wonders. #MomTruth: Sooo, my income isn’t exactly what it used to be while I’m on mat leave. I’m not too sure I need another white v-neck from Aritzia. My advice is to shop smart and invest in clothing that you will wear during your mat leave. Perhaps skip the Jimmy Choos and opt for a comfy cardi and a pair of stretchy jeans instead. Basically, my mom uniform. Don’t take yourself too seriously. Motherhood is the hardest job out there, so don’t beat yourself up. We’re all trying to figure it out and no one actually knows what they’re doing. We’re all just trying to survive! #MomTruth: I’m so stressed some days that I cry! My house is a mess and I’ve used dry shampoo one too many mornings. I know that a lot of my stress could be avoided if I just took a few deep breaths and a few steps back. Life is good and I have to remember to change my perspective. Mat leave is too short, so we need to laugh more and cry less. I have a year until I go back to work (yes, I took an 18-month mat leave), so I promise myself to keep aiming to live my absolute best (and healthiest mat-leave) life ever! I truly hope this post has inspired you to do the same. And if you’re ever in doubt of being on track toward mat-leave bliss, just pour yourself a glass of mommy juice and everything will be alright!